I bought this issue of SUPERMAN while visiting my grandmother’s house–the first comic book I ever knowingly laid down 35 cents for (or, more correctly, that somebody, likely my grandmother, laid down 35 cents for in my stead.) But how could i not? This was not only the second part in what would be a four-part opus, but look at that lovely Jose Luiz Garcia-Lopez cover. Sure, the placement of Amalak’s first balloon could charitably be described as “unfortunate”, but the drawing and the drama are all top-notch stuff, and head and shoulders above most DC super hero covers of this period. So when we had left off, Clark Kent and company were in central City on a newsman’s retreat, a mysterious plague nicknamed the “journalists Disease” and seemingly caused by the Kryptonian refugee Nam-Ek has been striking down the inhabitants of the city (including the visiting Lois Lane, who revealed that she intended to relocate to Central City), and Superman is losing it, having last month punched the Flash into orbit and seemingly and accidentally incinerated Nam-Ek by pouring kryptonite-infused lava over him. 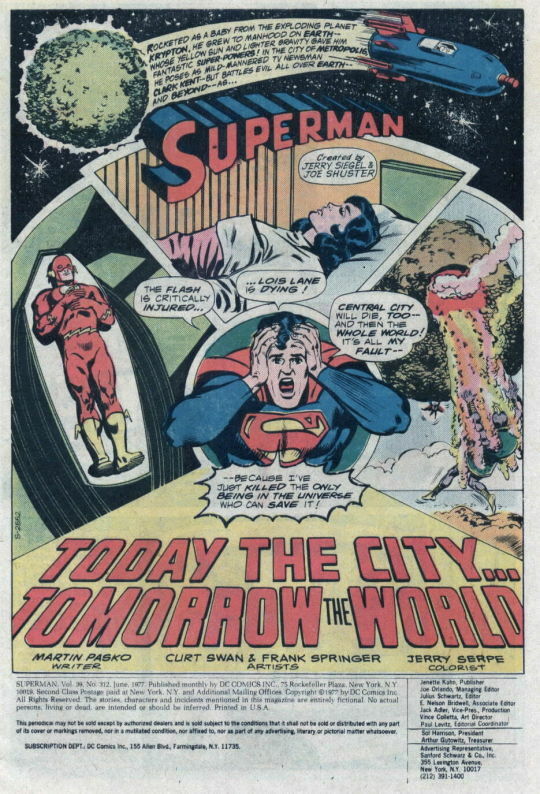 It’s no wonder he seems so stressed out on this lovely Curt Swan splash page. Chin up, big fella–writer Marty Pasko has even worse to throw at you before this story is finished. 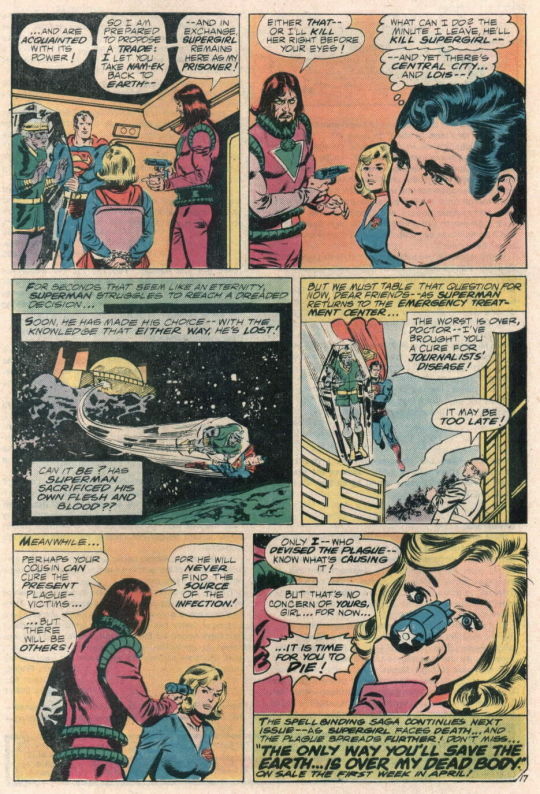 Visiting the Justice League satellite to check in on the recuperating Flash, Superman and Supergirl are informed by Green Lantern that he detected a teleportation signature when he went to retrieve the Flash from orbit. 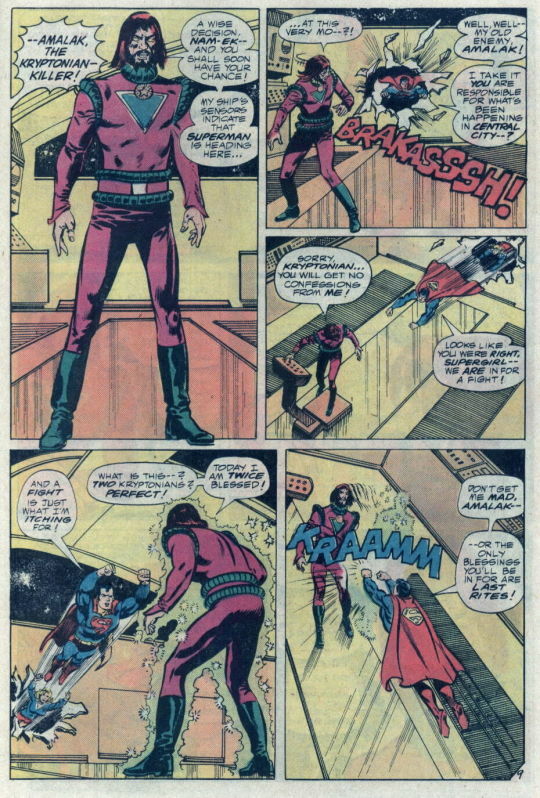 Realizing that this may mean that Nak-Ek is still alive, the two heroes from Krypton backtrack the trail of the teleport beam to a hidden asteroid base, wherein Nam-Ek has decided to throw in his lot with Amalak, the Kryptonian Killer. Amalak blames Krypton for the destruction of his own homeworld, and so he carries out a vendetta against anyone and anything from that now-long-destroyed planet. Mid-fight, we learn that, in is travels, Amalak had come upon Nam-Ek, and true to his vow attempted to destroy him. But Nam-Ek, made immortal by the healing properties of the Rondor horn on his head, proved impossible to kill. He escaped from Amalak and made his way to Earth, to warn Superman about the plague that Amalak intended to unleash there. But of course, Superman took Nam-Ek for the cause of the plague, and now the immortal Kryptonian has thrown his lot in with the killer. So it’s a fight of two against two, and only Nam-Ek’s power can eliminate the deadly plague. I’m speaking very much about plot, but it’s worth pointing out that, all throughout this issue, writer Pasko spends much of his time dealing with emotions–how those involved feel about what’s happening, and how those feelings cause them to act. So there’s some very good emotionalism at play here that raises this up from just another punch-em-up adventure. 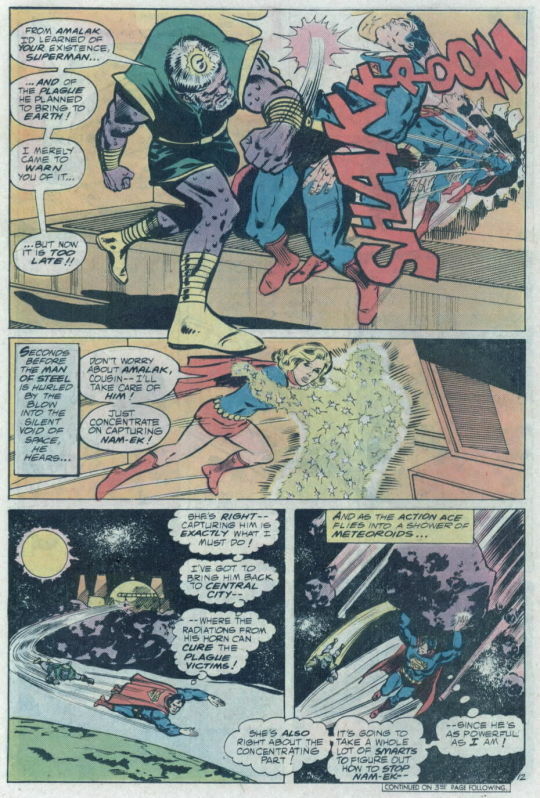 Anyway, Superman’s fight with Nam-Ek takes them outside of Amalak’s headquarters, and in the Man of Steel’s absence, Amalak is able to get the upper hand on Supergirl, and also to retrieve his ultra-powerful Star Cannon from Superman’s Fortress, where it’s been since his last incarceration. Out in space, Superman is able to defeat Nam-Ek, sealing him inside a makeshift life-sized glass prism that cuts him off from the yellow sun radiation that gives Kryptonians their super-powers. 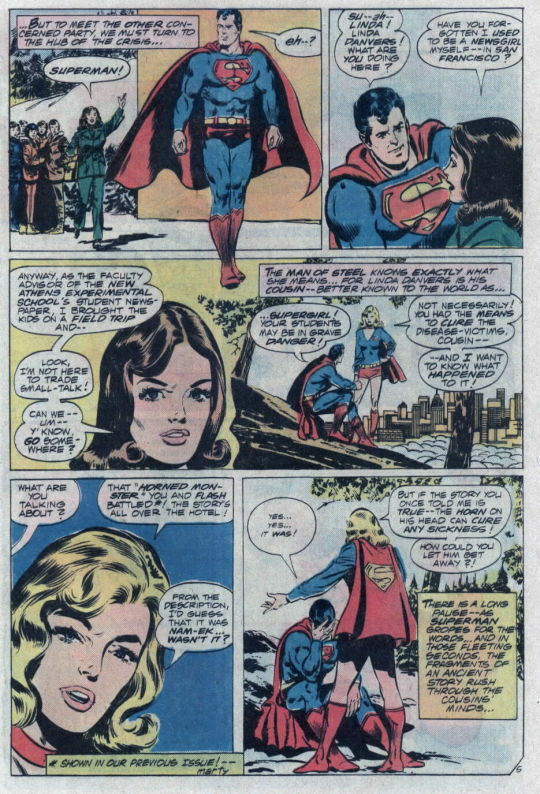 Returning to link up with Supergirl, Superman finds her under the gun at the hands of Amalak. It’s a standoff–and when Amalak proposes that he’ll allow Superman to depart with Nam-Ek if he leaves Supergirl here with him, the Action Ace reluctantly complies, thinking of the many stricken plague-victims in Central City that Nam-Ek can save. 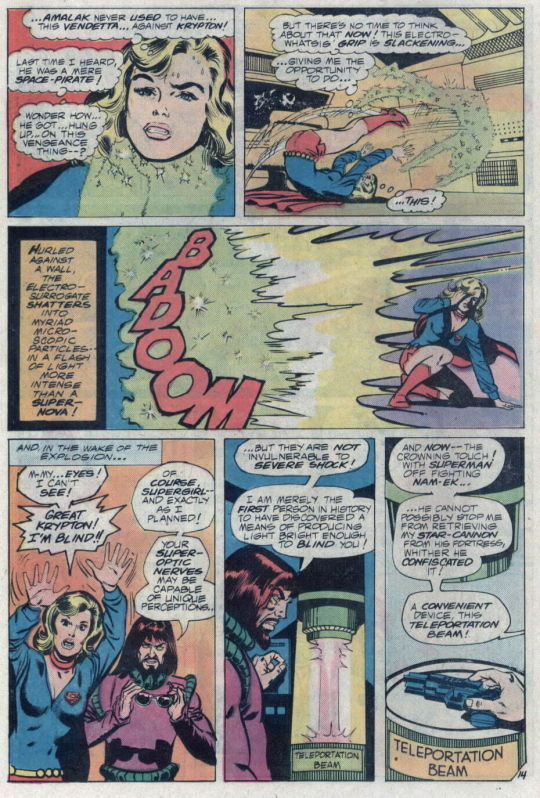 But as the issue closes, Amalak reveals to Supergirl that it doesn’t matter how many Superman saves, he’ll never find the source of the infections, and so the numbers will still grow exponentially. And now, he’s going to blow her head off. It’s another To Be Continued situation!